Lsscpp (lsscpp) added a comment to D4683: Support user icon sheets in PNG format. Couldn't it automatically detect mono or color PNG and in the latter case disable the colorization? Lsscpp (lsscpp) added a comment to T63516: Move tool settings bar to editors. Lsscpp (lsscpp) added a comment to rBe2f23d91b989: OpenVDB Voxel remesher: Initial implementation. Lsscpp (lsscpp) added a comment to T51231: OpenEXR DWA compression should not apply to non-color data passes. Lsscpp (lsscpp) added a comment to T58592: Keyboard shortcut cut links (Ctrl + click) don't work in the Shader Editor. I'm not sure it's a good idea to sacrifice all those easy modifier keys for box select options though. Consistency is nice, but we also have to look at what is actually useful and efficient. Lsscpp (lsscpp) added a comment to T54842: Merge groups and collections. I see @Okavango (Okavango) needs, they are common. Lsscpp (lsscpp) added a comment to T57683: New Material Preview. What is the scale of the scene? I mean, how one of those squares on floor is big? 1 BU? Lsscpp (lsscpp) added a comment to D3871: UI: add render output tab to properties editor..
Lsscpp (lsscpp) added a comment to T56510: Blender 2.8 Splash Screen Design. I like the design a lot. Now that we have this "First launch setup" layout, I think it would make sense to have an homonym operator somewhere* to call it anytime. Lsscpp (lsscpp) added a comment to T56175: Bug in glossy shaders with the new reflection fix to Bump and Normal Map nodes. Lsscpp (lsscpp) renamed T56175: Bug in glossy shaders with the new reflection fix to Bump and Normal Map nodes from Bug in glossy shaders with the new to Bug in glossy shaders with the new reflection fix to Bump and Normal Map nodes. Lsscpp (lsscpp) created T56175: Bug in glossy shaders with the new reflection fix to Bump and Normal Map nodes. Lsscpp (lsscpp) added a comment to T54951: Properties Editor Design. this way value and state are close together and the design is coherent through the properties. Labels going back in the fields? D looks more logical to me. Everywhere, beginning from right, you have: state, little padding, value field, little padding, label. In the special case of checkboxes, label is not aligned with other labels. But hey, it's a special case. Lsscpp (lsscpp) added a comment to D3474: Image: Refactor render slots to a dynamic list. This is a fantastic improvement, great work. It would also be useful if Blender could automatically "auto advance" to the next slot upon rendering. I can't envision a situation where you'd intentionally want to overwrite an existing slot, but one often wants to compare sequential images and forgets to change slots before, unintentionally overwriting the previous one. Would something like this be viable to reduce clutter and to give a better separation for customizing UI? Lsscpp (lsscpp) added a comment to T54711: 2.8 UI: Small, independant UI tweaks. Maybe instead of a "V" you could try using a circle/dot checkmark. Usually radio buttons are displayed like that. Just for the sake of consistency, how do you visually communicate in popovers what options have a radio-button behaviour instead of a checkbox one (on-off)? Currently the all have checkbox appearance (you are allowed to think that e.g. you can enable multiple falloff or pivot-point). Lsscpp (lsscpp) added a comment to T54965: 3D View Collections Design. Lsscpp (lsscpp) removed a watcher for Code Quest: Lsscpp (lsscpp). Lsscpp (lsscpp) added a comment to T54908: Workbench UX design. Also detaching the popovers to place them around the viewport becoming pinned automatically. So far it's not possible to have the old wireframe viewmode: transparent faces+wireframe. Now, assuming that an additional shading mode (transparent) can be added, we would then have to perform two (mouse movement+)clicks to achieve what now we achieve with one Zkey press. Lsscpp (lsscpp) added a watcher for Code Quest: Lsscpp (lsscpp). Lsscpp (lsscpp) added a comment to D2662: Cycles: Adaptive rendering based on a norm of rendered pixels. 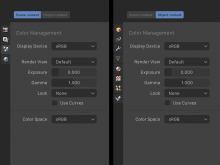 Ideally the adaptive sampling should take color management into account indeed, though in general it's unknown what kind of image transforms might be applied in compositing. A simple color_scene_linear_to_srgb() or sqrt() might already see a noticeable improvement. What I miss is a comparison at same render time: plain vs adaptive. The original render takes hours but deciding what is 100% quality sounds arbitrary here. One thing I didn't understand: is the check done at pixel level or at the whole tile? So I understand that Norm here is a sort of threshold, right? Then, setting Norm, is like setting the "main level of smoothness" of the image. Could this include a time-halt condition? Lsscpp (lsscpp) added a comment to D2574: Cycles: Implement optional normal adjustment that ensures valid reflections for normal maps and bump maps. Lsscpp (lsscpp) added a comment to T51008: Normal map with bold relief causes black artifacts with Glossy BSDF shader. Lsscpp (lsscpp) added a comment to D2313: Cycles Disney BRDF. Occasionally testing this branch (build 26e906d) it appears to have a major bug rendering SSS with Branched Path Tracing, as shown in pictures here: https://blenderartists.org/forum/showthread.php?403342-Cycles-Disney-Brdf&p=3162218&viewfull=1#post3162218. Basically branched takes care of base color only, as if it is ignoring the SSS color input. Lsscpp (lsscpp) created T47656: Branched Path Tracing samples can go down to 0 (??). Lsscpp (lsscpp) added a comment to D1281: Cycles: Adding a "No Override Layers" option. 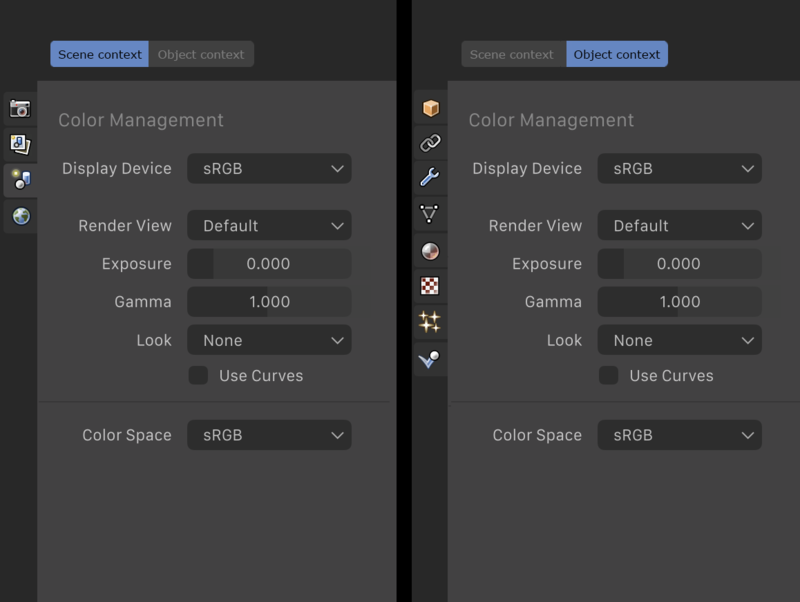 I think that a feature like this would be better than making two or more renderlayers and compositing just because two render layers mean two different renders in a row, which means more time. I don't know how blender works under the hood, I imagined that with material override there's some "switch material" at the end for every object, so I thought that it would be easy to just mark some objects to be excluded from this switch. Hi Lukas, great to see you giving some time to this, thank you a lot! As posted on BA, there could be another option for this, that is having the override driven by a group instead. What do you devs think is more appropriate? Lsscpp (lsscpp) added a comment to D1132: Cycles: Experiment with making previews more interactive. Sorry if this can be seen as a feature request: currently the rendered preview redraws on *any* change happening in the node-tree even if the node added/removed/changed is not connected or evaluated (mix=0/1 conditions). This is sometimes annoying since long and clean previews get cleared (and slow the system down while re-rendering) while one is making some node operation that don't affect the final material appearance. For the sake of this kind of optimizations, do you think that this can be addressed? Lsscpp (lsscpp) added a comment to D301: Number of samples taken per progressive iteration. Hi, being a former Maxwell user I can say how much progressive refine can be useful, giving you the chance to stop the process anytime and have a full-frame render anyway. The plus in Maxwell is that for each step it actually writes a temp image, to keep the job safe in case of a crash or power failure. Lsscpp (lsscpp) added a comment to D808: Adaptive stopping and sample distribution for Cycles. 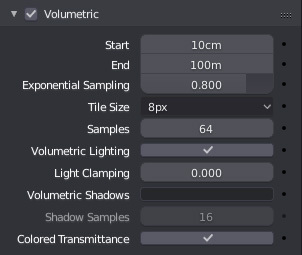 Hi Lukas, regarding the UI debate, what about adding just a slider named "AA samples multiplier"? It could come along with a text exposing the evaluated total, as well as how it happens in the bottom of the samples panel when you enable branched path tracing. Also, I don't know if the word Confidence comes from the papers or from some JND/MonteCarlo/math-related glossary, but for us final users wouldn't be Convergence or Smoothness more obvious? Lsscpp (lsscpp) added a comment to T42212: Probable bug in (regular) Path tracing method. Lsscpp (lsscpp) created T42212: Probable bug in (regular) Path tracing method. Lsscpp (lsscpp) added a comment to T40774: adaptive sampling v01. Still i can't see benefits in my daily usage ...probably beacause it's not clear to me what this patch is actually doing! Anyway. How can Blender users have a try at your patch? Hi, I'm quite interested in these adaptive solutions. How do you manage to avoid visible tile boundaries in a low sampled render? Using (entire)tile stop condition easily lead to have adiacent tiles with equal threshold but visible difference in terms of noise, as I experienced with the other experimental method developed by likas. Lsscpp (lsscpp) added a comment to T38401: Metropolis Sampling. Yes indeed, my tiny test showed way lower speed gains. Indeed almost no speed gain for bit-noisy renders. But this is probably my fault. Do I read well: now your CPU rendering is 4 times faster than GPU... instead of 8 times slower?? This means 32 times faster in CPU/CPU comparison!! Or in other words, 3200% speed boost, or also rendering in ~3% of the time! How hard - if ever possible - is it to implement per-pixel stop condition? Lukas, what is actually the difference between "adaptive stopping" and "adaptive stopping+sampling" ? IIRC LuxCore implementation uses max error inside each tile, and it sounds reasonable too. This way you always know how much the error might be. Can't wait to test this out. Can you (ora anyone) please upload the build once it is ready? There is also one more opportunity: time halt condition. To make this possible the engine should know how long each tile takes to render, so a first pass (with a minimum sample number to be decided) should be done for all the tiles. This would give two benefits: a proper render-time estimation, and a first rough look at the whole render output. Lsscpp (lsscpp) updated subscribers of T38401: Metropolis Sampling. Lsscpp (lsscpp) added a comment to T37982: File Browser options minor UI improvements. Any chance to have a preview area in the file browser? @Jason Clarke (jtheninja) can you please make another BMW test with no adaptive, letting cycles run for 3:03 as well, so we can see how better the algorithm distributed the samples in the same amount of time? I actually did a search... Google this: "entropy based adaptive sampling paper"
Lsscpp (lsscpp) added a comment to T37450: Tool settings panel location in the UI. Hi, i'd like to resume here a mockup i made a while ago on BA UI enhancements thread.